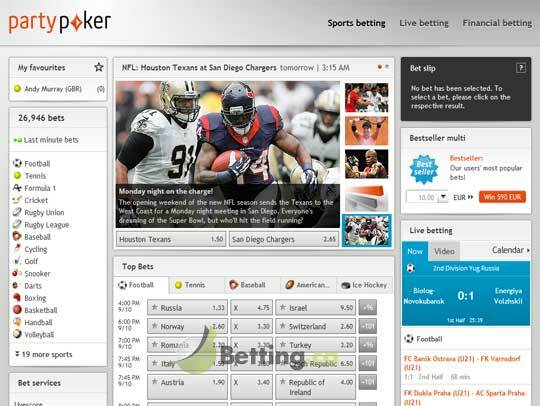 Important: partypoker bets is now part of Bwin Sportbook after completing its merger, Bwin will now be the homepage. There are no shortages of places where you can have a flutter on any sporting event that has caught your eye online however, there are only a handful of sites that allow Canadian based gamblers a fully licensed and regulated site offering worldwide betting opportunities, and one that we can highly recommend is the partypoker bets site. They are many individual features and qualities of this truly International betting site that make it stand out from the crowded online betting market place, and as such we are going to highlight many of these qualities in our partypoker bets review below. 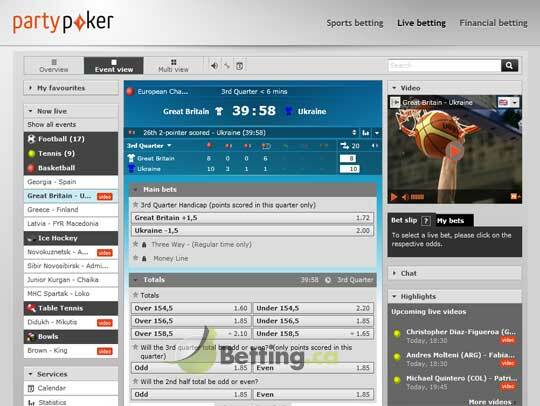 The first thing that you cannot fail to notice when you visit their online betting site is just how easy it is to use, they have ensured every aspect of it is completely user friendly and this starts with the registration process that takes just a couple of moments to complete, and then, once you sign up and log in you can seamlessly and instantly place your chosen wagers with just a couple of clicks of your mouse. The partypoker bets site is the online betting fully owned and operated by the mighty Party Gaming PLC gaming empire, and as such with them having many years of experience under their belt with their online casinos, poker site and bingo site, there is nothing that they do not know regarding what online gamers look for and want from a betting site. You will also find that they offer a comprehensive results service, and as such you can always find the results of any sporting event or fixture when you visit their site. A full audit trail of every single wager you have placed is also available to you, so you will always know just how well your previous betting sessions have been and can review each and every one of them instantly. Once you have signed up and become a new customer of partypoker bets then having logged into their betting site you can access each and every area of it, and there are of course many different sections of this state of the art betting site that will allow you to quickly find the exact type of wagering opportunities you are seeking, below is just a small selection of their available betting opportunities. Live Sports Betting – With partypoker bets having a large and experienced team of market makers you are going to find when you access their live sports betting site that you will be offered a plethora of wagering opportunities on every conceivable sporting event. The odds on offer are updated instantly and in real time, so securing some of the best odds in the industry is a completely hassle free experience. Football Betting – One of the most popular sections of the partypoker bets site is their football betting markets, should you be one of the millions of people who love nothing better than placing wagers on your chosen football teams or chosen football players each week, then it will pay dividends for you to move your wagering over to the partypoker bets site, for the sheer number of available football betting options is massive. 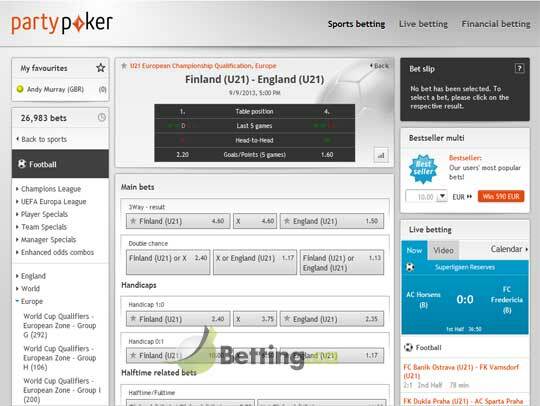 Financial Betting – There have been, in recent years, more and more punters who have started to wagers on financial markets, some of these punters are simply looking to expand their betting opportunities whilst some try and offset any possible movements in currency markets for example when they have planned a vacation. Should the exciting world of financial betting be of interest to you then make sure you take a look over the partypoker bets website for there are no shortages of wagering options on offer. Ante Post Wagering – One of the more commonly used ways for a sports bettor to secure the best odds on any kind of sporting event is for them to place their wagers well in advance of the event in question. This is where the Ante Post markets on offer at the partypoker bets site is going to be of interest to many people, for when placing an Ante Post wager at this leading betting site, the odds on offer are usually way higher than they are in the days and hours running up to the kick off time of the event in question. You will find that it is always the most forward thinking online betting sites who are the first to grasp new wagering opportunities and offer them to their army of customers. With mobile gaming being the very latest innovation then it will come as no surprise to you to learn that partypoker bets have now launched their very own fully functional mobile betting site. So if you like the idea of placing a wager on the go, then simply log onto the partypoker bets mobile betting site or open their betting App and you will be placing your wagers in no time. The only way any online betting site is going to keep you as a customer is by offering a fully rounded type of betting experience, this means hassle free deposits and withdrawals, the best odds in the business along with plenty of value packed promotional offers to increase your winning chances. This is what you are guaranteed of when you become a new customer of the partypoker bets site, and they will offer you not only a sign up free bet offer, but being a regular customer of theirs means you are going to be offered plenty of additional value packed promotional deals and offers which adds an additional level of value to your online betting.